53 Who believes what we’ve heard and seen? Who would have thought God’s saving power would look like this? Ever notice how things with God can sometimes be backwards? He gave death to bring life. He sent His only Son Jesus to die so that we may live. There are times when I just don’t understand the whole deal, yet I am ever grateful for this opportunity of life. I am thankful for the life I have been given so that in turn I can give life to the death in other’s lives. From the moment I knew that I was to be a writer for Jesus, my one desire is to mend the hearts of the broken. As I myself have healed from many hurts and wounds I want others to be made whole in His presence. His grace is what pulled me out and it is by that same grace I write. We were given life so that we can bring the revelation of life to others. Today my husband and I visited a regular customer of mine who had recently been hospitalized. Her and her husband have been in my drive thru every morning for the past two years and I felt compelled to visit her. I brought her both copies of my books and we sat and chatted for awhile. Then we prayed over her. She was ever so touched by the mere fact that we stopped to see her. This is the impact God wants us to make on the world. I can’t tell you what compelled me to visit this person I knew nothing about, yet I know it brought some life to her day. It’s always the little things that matter the most when it comes to showing love to someone. Take for instance when my hubby picks one single flower and places it in my hair it is much more special than a dozen roses. When someone just simply smiles randomly as you pass by it is way more appealing than just rushing right on by. When someone stops to pick up something you dropped when they could have just walked away means more than them just ignoring it. Do see what I am trying to say? It is the little things which matter the most and those are the things I like to partake in. So where am I going with this when Jesus dying on a cross was such a huge act of love? Because with one death, the world gained life and for those who choose Life in Christ, they will see so much more come to pass in their lives than the ones who deny His very existence. In death we find life. In darkness we have found Light. 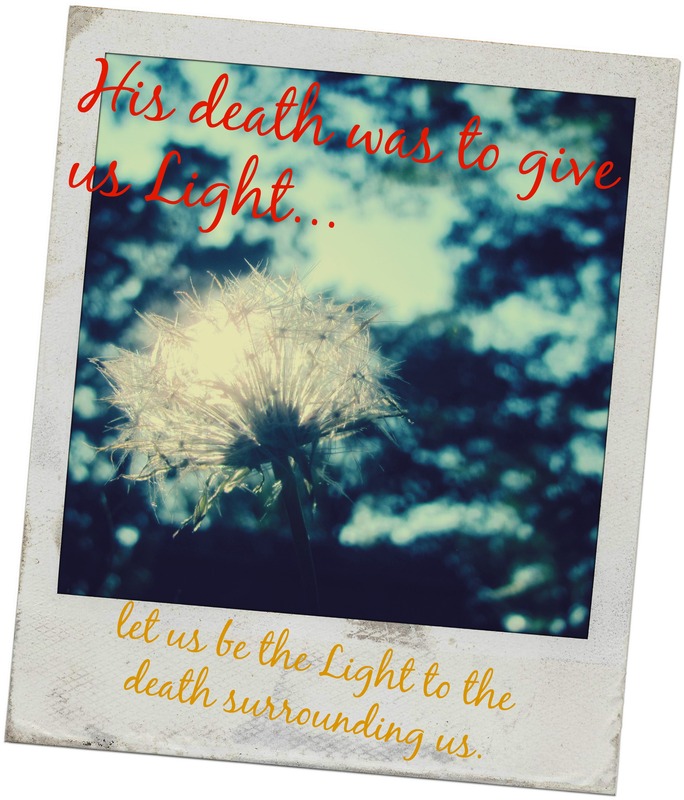 When we find death in our situations we get the option of shinning the Light of Jesus on it and moving forward. We have the opportunity then to speak life into other’s darkness. This is who I was designed to be through my writing. I am able to shine a light where maybe only darkness brooded. Can you be a Light to those around you? What can you do to share Life? Are you willing to allow Jesus to enter into your very own darkness? Are you ready to let Him shine through you so that others can see just how much life they can have? Everyday I strive to shine, some days it is not easy, yet it is by His grace I am able. With His grace I can smile. With His grace I can stop and help someone. With His grace I can be a Light in such a darkened world. If what I write changes one mindset today, God will have used me. The key to all of it is…are you willing to be used? Are you willing to let God bring life to your death? Are you willing to be changed so God can use you to change others? It’s tough at first I know but what joy comes when you see someone surface from darkness. Are you somebody’s only Light to Life? 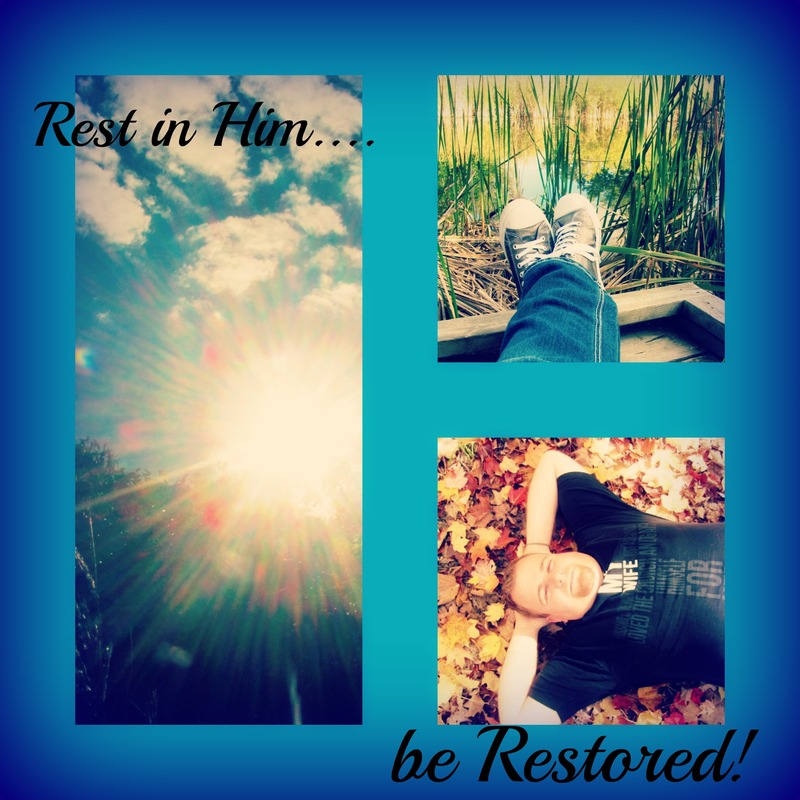 I’ll refresh tired bodies; I’ll restore tired souls. Ever just been tired? Too exhausted to even take another step or get out of bed? Just dreading making a move of any kind? I think we have all been there at some point in our lives. Often there is just not enough time in a day and we wear ourselves out trying to get everything done. In today’s society there is not much time allotted for resting let alone actually sleeping 8 hours a day. We hardly ever take time to rejuvenate our souls, minds and bodies. No wonder we come to this place where nothing matters and we have no desire to do anything. The word “rest” is mentioned 525 times in the King James version of the Bible, to me that makes it pretty important to God. We were created for fellowship and in order to have a relationship with anyone including God, we need time. Time to slow our lives down long enough to quiet our minds so that we can begin an intimate relationship. How do we get to this point? Where do we add an hour to any given day? Do we skip breakfast to take time to rest? Do we go to work an hour late? Do we cut out family time to meet with God? None of those options seem to make sense. What it took for me was making time. Yes it was a sacrificed period of time in my week to spend with Jesus. It started on Saturday nights at a soaking service. A 3 to 6 hour span of time to just sit in the presence of God. I know it seems it bit extreme when before this I barely said good morning to Him. I think I just got to a point where I was sick and tired of being sick and tired and I wanted desperately to be changed. I wanted to experience rest and I needed it ever so badly. As I began to spend my Saturday nights at church instead of sitting home on my Facebook or watching movies, I began to see Who God really was. As the weeks went by I began to include God into my daily life and soon He was a focus all the time. Now I am to a place where I can pray and worship and have a living relationship with God all day long. From the moment I awake and say Good Morning Lord to the very end of my day. I can pray anywhere, any time. I can sing worship songs in my head even at work during our busiest rush. The more I seek Him the more at rest I feel. It all begins with our thought life. What do we consume our thinking with? Debt? Stress? Worry? Failures? Future issues? Past regrets? There is so much that we think about that has nothing to do with God. I challenge you to start talking to God. Begin with a Good Morning and end with a Good Night. It takes taking that first step. Then include Him into your breakfast time or lunch hour. Say a simple random prayer here or there peppered throughout your day. Soon before you even realize it, you are in a more intimate relationship with God than ever before. Resting does not necessarily mean sleeping or sitting or lounging around, it is in the mind. When our thought life includes God there is a lot less confusion and frustration going on in our minds. When we are not consumed with all the things of this world, God can override and give us peace and rest. With this mindset we can do anything we set our minds to. Resting IN Him simple means we surrender our lives to Him. We give Him permission to refuel our spirits and give refreshing to our minds. Resting IN Him is what gets us from dot to dot in this crazy world.